The current TB treatment relies on the “Directly Observed Therapy” (DOT) which is combinatorial therapy involving 4 medicines (known as first-line drugs). This "short" course treatment for TB combines isoniazid, rifampicin, pyrazinamide, and ethambutol for two months, then isoniazid and rifampicin alone for a further four months. The patient is considered cured at six months (although there is still a relapse rate of 2 to 3%). For latent tuberculosis, the standard treatment is six to nine months of isoniazid alone. Though proven effective this treatment regimen is too long and risk prone as discontinuation of courses leads to the development of new deadly drug resistant strains. It has been estimated that, of the 1,556 new chemical entities marketed worldwide, between 1975 and 2004, only three were for tuberculosis. 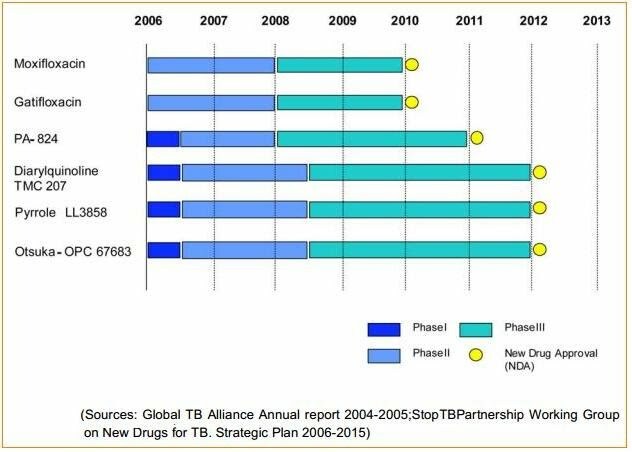 Development of a TB drug pipeline is essential after decades of apathy. There are still far too few compounds that represent new chemical classes with novel mechanisms of action and a low probability of encountering drug resistance. The market size has been a major driving force for new drug discovery programs in major pharmaceutical companies. It has been roughly estimated that the discovery and development of a new drug costs approximately between US$ 250-800 million and takes about 12 years. Although the big pharmaceutical companies have made commendable contribution to the discovery of drugs for several diseases yet the initiatives for the discovery and development of drugs for infectious diseases such as tuberculosis are lacking. The prohibitive cost of Intellectual Property protection and maintenance, and the confidentiality of drug development do not allow collective efforts of the best brains of the world at national laboratories and academic institutions to work together with industry. Solving the bottlenecks at early stages of drug discovery like target identification, target validation, etc is key to finding novel drugs for TB. Only availability of rigorously validated targets and lead compounds that inhibit them could mitigate the risks of pharmaceutical companies in bringing such drugs to the market. OSDD aims to provide a platform for knowledge sharing and collaborative research leading to identification of novel drug targets. This global collaborative effort is expected to reduce the time expended in conventional drug discovery process. Nature describes TB as an orphan giant that claims millions of lives every year. No new TB drugs have been developed in the past almost 50 years. It is often described as the disease of the poor and the pharma industries tend to bypass drug discovery for TB owing to the lack profitable markets. Today’s first-line TB drugs are more than 47 years old and must be taken for 6-9 months, while treating MDR-TB usually takes 18-24 months. Inconsistent treatment breeds drug-resistant strains that increasingly defy current medicines. Faster acting drugs are needed to shorten treatment duration, and new drugs that attack novel targets are needed to fight resistant strains of M.tb. TB research is an insular field and TB drug pipeline has been subjected to decades of apathy. Despite the advances in research and technology there are still far too few compounds that represent new chemical classes with novel mechanisms of action and a low probability of encountering drug resistance. The market size has been a major driving force for new drug discovery programs in major pharmaceutical companies. Although the big pharmaceutical companies have made commendable contribution to the discovery of drugs for several diseases yet the initiatives for the discovery and development of drugs for infectious diseases such as tuberculosis have been bypassed due to lack of market incentives. The prohibitive cost of Intellectual Property protection and maintenance, and the confidentiality of drug development prevent collective efforts of the best brains of the world at national laboratories and academic institutions to work together with industry.